Sometime during the week of January 24th, 2011, my husband Chris was reading a Boat US magazine. He described to me a "for sale" ad for a property - cottages with a cafe, marina, art gallery - then went to the computer to look for more information. Soon after he called me in to look. From his verbal description I assumed he was describing one unit within a larger one, and I wondered what could be different about that one vs. the many other resort-type properties to which we have dreamed about retiring. But upon seeing the website, I realized it was an entire property for sale at a price realistic to us. We agreed it was worth seeing and made plans to go down that weekend. Upon seeing the property that Saturday and were blown away by how it looked as good, if not better, than the pictures online. We met the women running the restaurant and they were as nice as could be. We walked around the town and were charmed by its old Florida feel. Our good friends Rich and Lesa joined us and we stayed in Matlacha for the night. We had a great dinner at Bert's Bar and Grill, then returned to the Griffin Cafe the next morning for breakfast and to show the property to our friends. They were equally (if not more!!) smitten. We returned the next weekend with more friends (Tom and Wendi and a repeat visit from Rich and Lesa, who came equipped with champagne!) and the excitement built as we all agreed, it's a perfect fit for us. We made an offer that week. After some back and forth, we came to a verbal agreement on February 18th with the official paperwork to follow. I was already shopping for furniture and planning inventory for the boutique. 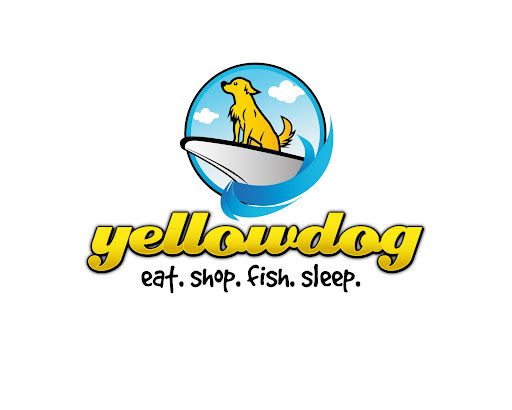 We wanted to name it in honor of our golden retriever-child, Tiki, and Yellowdog was born. Our plan is to take over operations on June 1. As the restaurant is already being run, we will continue to have that operate as is. We will furnish two of the three cottages for week/weekend/weekly/monthly rentals, and plan to advertise these for rent on VRBO and Homeaway.com. We plan to open the boutique on our first weekend in operation, June 3rd. There are currently yoga classes being held in the gallery on Tuesdays and Thursdays that I hope will continue and expand. We plan to purchase stand-up paddle boards to rent out, along with some kayaks. Once we build a boat lift and bring the boat down, Chris hopes to operate boat tours and fishing trips. That's the plan....please wish us luck!